Am 13.11.2010 veranstalten wir eine Party: SOFA die Erste. 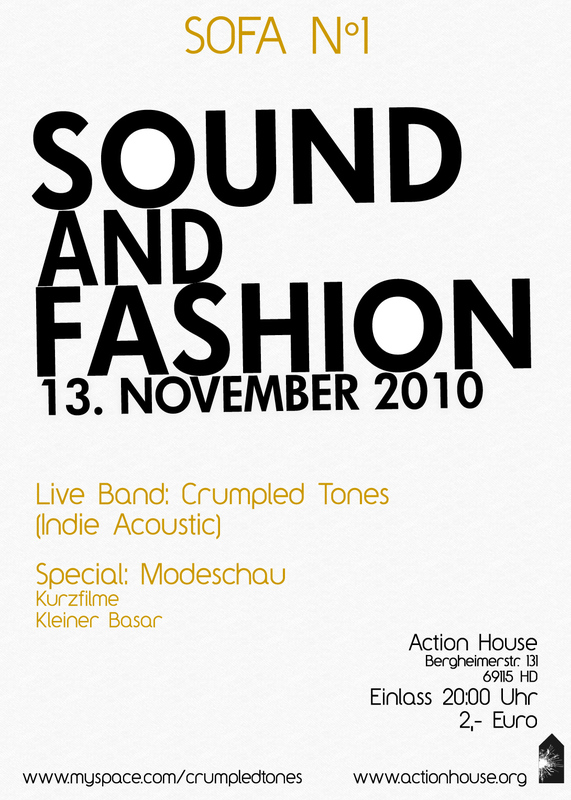 SOFA steht für Sound And Fashion: Die Heidelberger Indie Band „CRUMPLED TONES“ gibt ein Wohnzimmerkonzert in der Action House Lounge, und der Nähworkshop der Nähköniginnen führt eigene Designs auf dem Laufsteg vor. Einige der präsentierten Modelle können bei einem kleinen Basar erworben, bzw. bestellt werden.Snacks gibt’s auch und wahrscheinlich ne kleene Bar. Wir freuen uns über jeden, der mit uns feiert! 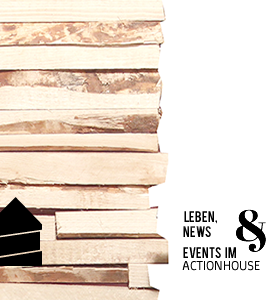 Sticky: Action House Heidelberg bietet Englisch Training an! Check out this video and keep your eyes out for the next. I’m SO THRILLED about this, and you’ll see why. Hi this is Chad from Action House Heidelberg. If you don’t know about Action House Heidelberg, I gotta tell ya, you’re really missing out on something cool. Action House Heidelberg offers temporary studio space to creative people in the Heidelberg area, whether that means artists looking for a place to create, exhibit, or sell their art, entrepreneurs who need a desk, an internet connection and some basic office supplies, or people wishing to teach (or learn) new creative skills. I myself am getting ready to offer an English course, and to tell you the truth, I think this is gonna be pretty spectacular. Now, even if improving your English doesn’t interest you, I ask that you watch this video to the end, because I have something special in store for you that I believe will blow you away. But first, let me tell you about the course. Starting in the beginning of January, I’m going to set aside an hour a week to help you with your English. It’s going to be a very stress-free, easy course emphasizing conversational English in a group. No textbooks, no homework, just English conversation. You see, most people don’t have any trouble UNDERSTANDING English, but when it comes to SPEAKING, they can’t seem to put the words together correctly and keep up with the conversation. The reason why practicing conversational English is important is, any language you learn gets picked up through repeated exposure to that language. The reason I speak English as well as I do is because I experienced the language quite a bit. Massive amounts of English input is how I learned English, and in this course, it’s how you’ll be learning English too. As a language learner, once you’ve gotten the right amount of input, you start to develop an intuitive feeling of what is right and what isn’t, and you can learn to trust your intuition. My role isn’t as a teacher or an instructor of some sort, but more like a guide or a coach. What you’ll get is the opportunity to get English input which will be helpful in building your passive vocabulary, and the chance to speak English with the other participants and with me, which helps shift your passive vocabulary to active vocabulary. 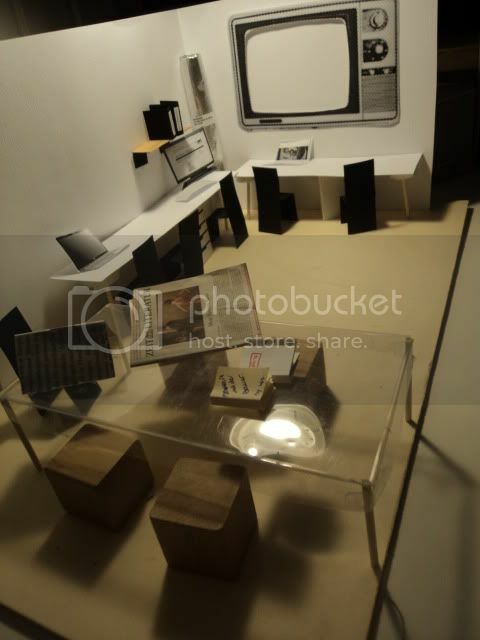 I can also offer you guidance and correction, and I promise the topics will be interesting and thought-provoking. Potential topics I’m interested in discussing might be global or local politics, short film, sociology, history, subculture, music, poetry, literature, or creativity, but since this is a conversation, you can also feel free to bring up anything that interests you. Now, I’m recording this in English because I want to make sure that the people who decide to come to this will be people that already understand English pretty well. Just so we’re clear, this event would be inappropriate for someone who has a lower level of English comprehension, so if you don’t quite understand everything I’m saying here, this is not the right course for you. One other thing, the price of this course is much lower than anything similar you can find from any other language school in the area, and if you’re on facebook, I’ve got an extra bonus for you. In my next video, I’m gonna tell you exactly how you can join this course for a whole month and not pay a cent. And remember, even if you don’t take this English course, I’m gonna make it worth your while. If you go through the process I show you in my next video, even if you don’t attend the English course, I’ll make sure you know how much I appreciate it. I can’t tell you enough how excited I am about this, and I hate to tease you like this, but watch my next video and I promise I’ll lay it all out on the table, because I’m sure that you’ll share my enthusiasm. Action House is devoted to helping people change from being consumers to producers of culture, and we also support the act of remixing our world to make meaningful expressions of ideas. Note: I wrote this a week ago, but the translation has not been forthcoming. I’ll try to get it updated soon, but wanted to post this while it’s still a timely news story. Some people have been rather quick to criticize the appointment of Frank Zumbruch as the Commissioner for Culture and Creative Industries in Heidelberg. While some have made valid points (or at least strong arguments) I can’t help but ask the question, what result are they hoping to achieve? I for one am grateful that the city has recognized the need to cultivate creative workers for a creative economy, and I see this as a step in the right direction. Regardless of how fair or unfair it was of Dr. Würzner to just GIVE him the position without the knowledge or permission of the Gemeinderat, I don’t think anyone can disagree that it’s a sign of forward thinking that such a position even exists. Most people I talk to seem to say the same thing: agree or disagree with his policies, Oberburgermeister Würzner GETS THINGS DONE. The last thing we need is a slow, bureaucratic government holding us back. That this announcement came as a surprise to many is not proof that this was a quick decision, but even if it were, sometimes quick decisions are necessary. Additionally, the accusations of nepotism or favoritism seem like just the sort of small-minded political manipulating that we’ve come to expect. As far as WHO should hold the position, I say, who else? Aside from Frank Zumbruch, I can think of no other candidate who has been as visible, as vocal, or as well positioned to be appointed to this office as Frank Zumbruch. 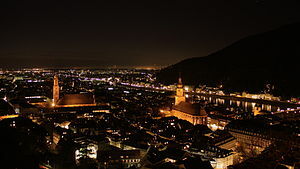 That’s not to say that no one else is qualified, but at this time, he is, at least in my mind, most capable of establishing Heidelberg and the surrounding area as a 21st century capital of creativity in Germany. Nobody knows how this will continue. Perhaps this office will continue by appointment, perhaps by election, or perhaps because of the numbers of people who like to find something to complain about, perhaps this office will cease to exist, and Frank Zumbruch will have been the first and the last. For all I know, I will be next in line to hold this position. But it could just as easily be yours, next time around. Numerous people seem to hold the position that „Frank Zumbruch is the right man for the job, but how he got it is questionable.“ C’mon people, if he’s right for it, nothing else matters. At the end of the day, what’s important won’t be our bickering, but our commitment to build the framework for the future of Heidelberg as a city where creativity is a commodity. Vergangenen Donnerstag gab es den ersten Workshop zum Thema Kreatives Schreiben mit Cosima. Zuerst gab es kleine Schreibaufgaben, die allmählich intensiver und anspruchsvoller wurden. Ging es zu Beginn noch um einfaches Brainstorming zu zufällig gezogenen Wortkarten, so wurde daraus in Runde zwei das Schreiben eines kurzen Texts zur Aufgabe: In den Köpfen der Teilnehmer entwickelten sich fantasievolle Geschichten, die z.B. an den Beginn eines Politthrillers erinnerten, einen zombieartigen Albtraum umschrieben und wir hörten einen Text über das heimliche Hobby eines Landwirts. Mehr über den Workshop mit Aufgaben zum Weiterschreiben zu Hause (oder auch für alle, die leider nicht am Kurs teilnehmen können) gibt’s direkt auf Cosimas Blog. Ich freue mich jedenfalls schon SEHR auf den nächsten Donnerstag.